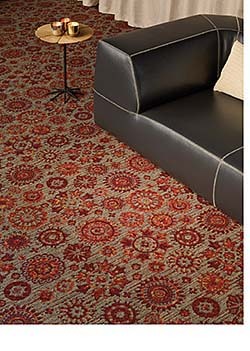 The Artisan broadloom collection in two patterns is inspired by hand-painted Spanish tile. Valencia combines a variety of icons and scales in a four-foot repeat. Barcelona has a smaller scale stylized botanical pattern. Features a mix of multi loop levels and cut pile in ten colorways. Made with Encore nylon and treated to be stain resistant.